(CNN) -- Triple Olympic champion and world record holder Usain Bolt set a new meeting record in Lausanne with a stunning run over 200 meters of 19.59 seconds despite appalling weather conditions. 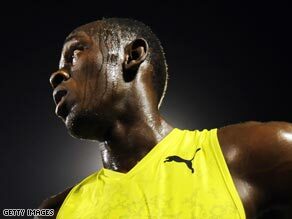 Usain Bolt is on great form ahead of the World Championships in Berlin next month. In the pouring rain the Jamaican sprinter clocked just one hundredth of a second outside of the fastest time of the year set by American Tyson Gay, in his first and only European 200 meters apearance before next month's World Championships in Berlin. In typical style Bolt left the field trailing in his wake as he ran a time that suggested in better conditions, he may be on form to threaten his own world record of 19.30 set at the Beijing Olympics. "I was not expecting such a good time with these conditions," Bolt told the Web site of the sport's world governing body, the IAAF. "But for me it was ok, as it was not too cold. I was not here to send a message to my opponents but to see at what level I was. I wasn't nervous, even with this weather. "I am always having fun when I run and people love to see me, so it was really great," the lanky paceman added. Olympic 400m champion Lashawn Merritt of the USA took the runner-up spot with a time of 20.41, while Jamaicans concluded a good night in the sprints in other disciplines. Asafa Powell triumphed in the 100 meter, to clock his second consecutive win at the Stade Olympice de la Pontaise, despite the strong headwind. It was successful night for Powell who had been sidelined with an ankle injury and sets up an intriguing meet with Tyson Gay in Rome on Friday. "I hate running in the rain but I am very happy with my performance," Powell said. "These were the worst weather conditions in my whole life but I ran my best race this year, technically speaking. I am definitely going for the World record." Elsewhere, Shelly Ann Fraser of Jamaica won the women's 100m race while Golden League Jackpot contender and double Olympic sprint medallist Kerron Stewart took victory in the 200m. "It was a bit cold but I wasn't thinking about it. I was thinking about my arms, my technique, my start," Stewart told the IAAF.